March is when you start your lawn care in earnest, clearing up and repairing bare patches. If it’s mild and dry and the lawn has grown it may be time for the first cut. This needs to be just a topping, not too short, to keep the grass protected until the frost have passed. 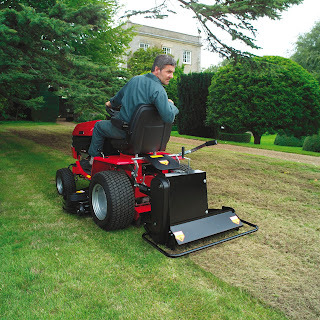 Raise the cutting height of the deck on your garden tractor or mower, gradually lowering with successive cuts. Repair edges by cutting out a section of turf and turning it around to face the cut edge and make repairs with a mix of seed and fine soil. If you have lumps and bumps in the lawn don’t try rolling them out, they will appear again. Make a top dressing (if you didn’t do this last month) with sieved soil, garden compost and sharp sand in a 3:2:3 ratio. Spread and level this in the depressions. Thatch will have accumulated and the old, dead grass needs raking out with a spring tine rake, or use a powered scarifier with your garden tractor. If you have worm casts don’t kill the worms, brush the casts into the grass before you mow. Moss can be a problem about now but make sure the grass is growing before treating it. Use a moss killer, you can get an organic one if you prefer. Then rake out the dead moss. If this leaves bare patches you can re-seed using a lawn patching pack of seed. It’s too early for weeding - next month, when the grass is growing vigorously, you can use a weed and feed product or water the lawn with a lawn weedkiller.